While on the familiarity trip in Honduras I was fortunate enough to meet Fito Steiner, (photo left, copyright Robert Hyman) a conservationist and the Volunteer Director for the Honduran Emerald Reserve. We actually met over dinner during the one night the participants of the familiarity trip stayed in Olanchito, but I was feeling rather lousy and uncommunicative that night so I didn’t get to know Fito at all until the next day when we were exploring the Honduran Emerald Reserve. What I found out is that Fito is passionate about conservation and very knowledgeable about not just the Honduran Emerald but the entire very dry tropical forest ecosystem of which the emerald is just one part. 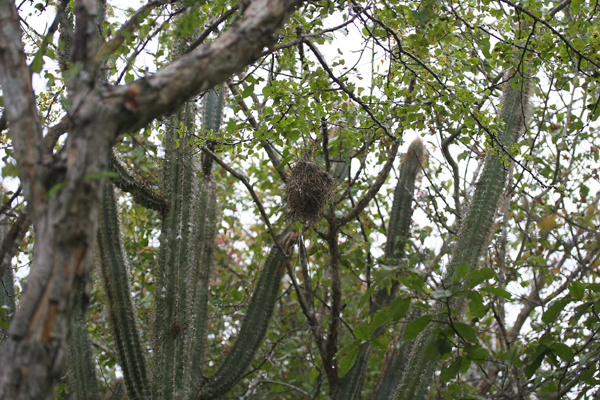 You might think that the only bird species that is endemic to Honduras and dependent on a specific and threatened ecosystem would be lavished with conservation funding with dozens of individuals doing study after study on the bird and its needs. You would be mistaken. Now, for sure, the Honduran Emerald isn’t ignored, but neither is it given enough of the attention that it needs…but read the interview below that Fito was kind enough to agree to if you want to learn more. And, yes, this interview is the first post from the Honduras trip to be presented out of chronological order but I couldn’t wait to get it published. Don’t worry, the rest of the Honduras trip reports are coming! 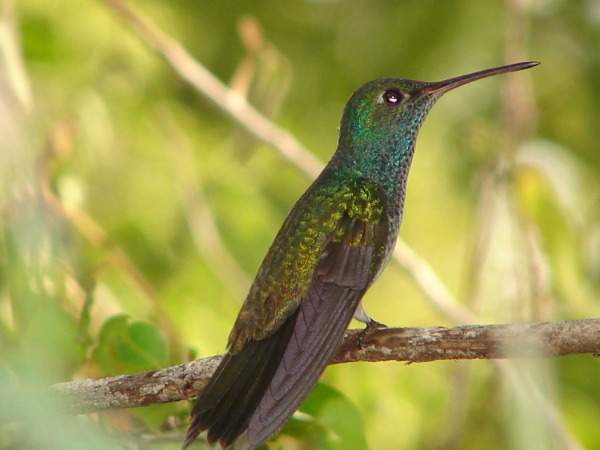 A quick note: the Honduran Emerald (Amazilia luciae) is Honduras’s only endemic bird species, and it is a beautiful little hummingbird. On the all-too-brief visit I had to the reserve in early March I saw several, including one amazingly cooperative bird that perched and preened within three meters for at least five full minutes. Of course, my camera batteries died after a short while so I can’t share any of my images, but I will carry a picture of that bird in my head forever. Fortunately for you, Fito tracked down and obtained permission to share a beautiful photo of the Honduran Emerald that is below. For more on the Honduran Emerald visit the BirdLife International Fact Sheet (and, if you are amazingly rich and are wondering where to put your money you could become the Species Champion for the Honduran Emerald!). Q- How did you get involved in working with the Honduran Emerald? How long have you been involved? I have been involved in Honduran Emerald issues since 2000. The number one reason is because I am from the very dry forest area myself and I was chairman of the Board of the Pico Bonito Foundation for thirteen years, so I was in position to involve the foundation and the park with the VDTF (very dry tropical forest). I have been looking for funds through Pico Bonito for the area and now I am looking on my own. Q-Who else is working on conserving the Honduran Emerald (and where does funding come from)? The World Bank, American Bird Conservancy, Secretaria de Recursos Naturales y Ambiente, Instituto de Conservacion Forestal, the Municipalities of Olanchito and Arenal, Honduran Emerald Working Group, Explorers Club, Hummingbird Society, etc. Funding has been coming from different sources, initially through the World Bank, American Bird Conservancy, Conservation International, United States Fish and Wildlife Service, The Hummingbird Society, and The Explorers Club. Q-Has the Honduran government been supportive of Honduran Emerald conservation? There has been some support for Honduran Emerald conservation but it has been very difficult to work with some of the many players in government because they all don’t have conservation in their own agendas. As you know the government of Honduras wants to pave the road that goes through the Honduran Emerald habitat, and the World Bank has been saying if the government doesn’t protect 2,000 hectares of habitat there will no funding for the road. The World Bank then donated some money to the government to help to protect some habitat. 230,000 U.S. dollars came from the World Bank. I wish there was more support from the government, and for three years the Honduran road works has been looking for some funding to protect the habitat through land easements to expand the Honduran Emerald Reserve, and to do some other projects. But, after funding was approved a year ago by the AECI (Spain’s equivalent to USAID) the government is just getting ready to work on those issues with that funding, and I hope most of the money will be invested in the habitat and not in the office. Q-How much does the average Honduran know about the emerald? Are the people living around the reserve supportive? The locals all know about the Honduran Emerald and that is a endemic bird, and I would love to say that they are supportive but I can’t. The owners of land around the protected area want to expand their properties and are cutting more and more VDTF to plant grass. Very few have been supportive and they send their cows to eat the grass at the Honduran Emerald Reserve. A few are setting aside some hectares of VDTF but most are waiting for the government to pay something or give them some benefits, and that is the idea with the Spanish project, managed by Spanish consultants, and there is a little bit of hope that they will do a good job in Honduras. Not far from the reserve not a lot of people know about the bird and a pride campaign is necessary to educate people about the Honduran Emerald, and the VDTF. Q-The Honduran Emerald Reserve has an active air force presence. What is that like and does the air force help or hurt the conservation of the emerald? This is a long story…originally the Honduran Air Force (HAF) bought the land during the cold war when Honduras was surrounded by guerrillas in Guatemala, Nicaragua and El Salvador. It was used as a base to supply the contras in Nicaragua, and as a shooting range for the HAF planes. In 2004, the HAF donated the land to the government and most of it became a protected area approved by Congress (excluding the air strip in front of the Environmental Education Center, the shooting area, and a control tower – a total of 90 hectares of military installations). They are there, in theory, because the Honduran president sends the armed forces to patrol and stop the illegal logging and poaching in the protected areas, but at the end they don’t really do anything: they just sit around, play cards and soccer and the hunters and cows are still are in the area. Lately they have been doing some drills for the privates from the different air bases, and they rotate out every two weeks from the deferment bases in Honduras. They still don’t accept and don’t understand that the reserve is a protected area and there are some regulations. It has been difficult figuring out what to do about this but we have to keep trying. Q-The Honduran Emerald, of course, lives in very dry tropical forest. What other species of plants and animals are protected when habitat for the emerald is conserved? The critically endangered iguana, Ctenosaura melanosterna is endemic to the Aguán Valley and certain small islands in the Cayos Cochinos of Honduras. Ther are five endemic species of trees and plants from the Aguán, and four more that in Honduras are only found in the Aguán Valley. Also, two subspecies of birds have been described from here, a Green-backed Sparrow (Arremenops chloronotus twomeyi) and a White-bellied Wren (Uropsila leucogastra hawkinsi). The very dry tropical forest is a place with a lot of endemism and it is being destroyed. Q-Are there other locations in Honduras where the emerald lives? Are those locations protected? 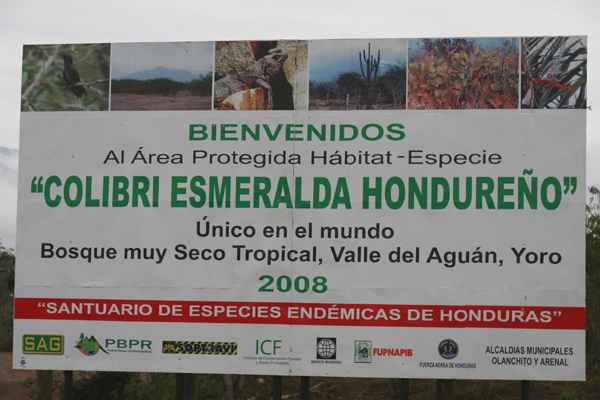 The only protected area for the Honduran Emerald is the Honduran Emerald Reserve in the Aguán. We hope to help to protect some areas in Olancho and Santa Barbara before they get deforested. Q-Roughly how many emeralds are there? Is the population increasing or decreasing? I have no idea but guys like David Anderson are talking about between 500 and 2000 breeding pairs of Honduran Emeralds in the country [ed. note: Bird Life estimates 250-999 birds total]. I personally think that the population is decreasing because there is less and less habitat. Q-What are the biggest threats to the continued existence of the Honduran Emerald? What is being done about them? Deforestation and lack of protection in Honduras, plus lack of law enforcement. Until now the only thing we are doing is telling the government to enforce the laws and crying about it when they won’t. The solution is to buy land to protect the habitat even though land around the reserve is very expensive. But in the long term buying the land is the best solution. Q-What can someone reading this blog post do to help the emerald? Tell the government to protect more and new area were the Honduran Emerald lives, donate money to buy habitat and equipment like field guides and binoculars to the Environmental Education Center, visit the area, write to Mr. Salazar about the proposal enlisting the Honduran Emerald on the Endangered Species Act. Corey, after the Mesoamerican month with Honduras, Guatemala and Panama posts, I sincerely think you owe your readers something like a “Brown non-descript Sparrow month” or an “immature Gull month”. @Jochen: Boring bird week? Disgustingly difficult to identify day? 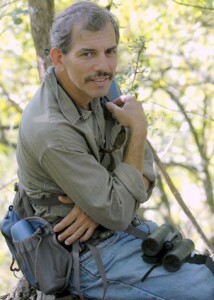 Corey, my name is Robert Hyman and I am one of the founding members of the Honduran Emerald Working Group. Thank you for the great story and interview with my good friend Fito. The photo of Fito that you have used was taken by me and if you would please include my Photo Credit with the photo I would appreciate it. Corey is overseas at the moment but rather than wait until he gets back I’ll add the photo credit myself asap. Thanks for letting us use the photo, and many thanks for all the hard work HEWG do saving this beautiful bird. Oops, sorry, Robert and thanks, Charlie.